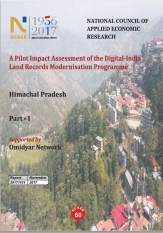 This report focuses on assessing the performance of the Digital India-Land Records Modernisation Programme (DI-LRMP) scheme in the state of Himachal Pradesh, and the achievement exhibited by the state in computerising and modernising land records. It is part of a study in which pilot impact assessments were carried out by NCAER in Himachal Pradesh, NIPFP in Rajasthan, and IGIDR in Maharashtra. The imperative for a land record management and modernisation initiative has been driven by the huge rise in the number of pending court cases relating to land disputes. Improvements on this front would not only help reduce property litigation, but also boost efficiency in land markets thereby facilitating the ease of doing business in the country. The Government of India recognizes the relevance and significance of land record management, which is reflected in its efforts to computerize the land records since late 1980s. In 2008, Department of Land Resources (Ministry of Rural Development), Government of India, merged the two existing land record computerization schemes to launch National Land Records Modernization Programme (NLRMP), which was revamped to Digital India-Land Records Modernisation Programme (DI-LRMP) in 2014. The immediate objective of the programme is to establish a modern, efficient land records management system in the country with real-time updated land records and it ultimately aims to achieve a system of conclusive titling that would ensure conclusive proof of the ownership of a land. The program has been in existence for many years, but had not hitherto been evaluated in detail in the field. In this context, pilot impact assessments were carried out in the three states. NCAER coordinated this effort and also prepared an overall synthesis report.